117 Marlborough is located on the north side of Marlborough, between Clarendon and Dartmouth, with 115 Marlborough to the east and 119 Marlborough to the west. 117 Marlborough was built ca. 1873 by building contractor James M. Standish for speculative sale. He and his wife, Sarah (Grant) Standish, lived at 283 Dartmouth. James Standish purchased the land for 117 Marlborough on October 15, 1872, from Dr. Edward H. Clarke, who had purchased it from the Commonwealth of Massachusetts on January 4, 1866. 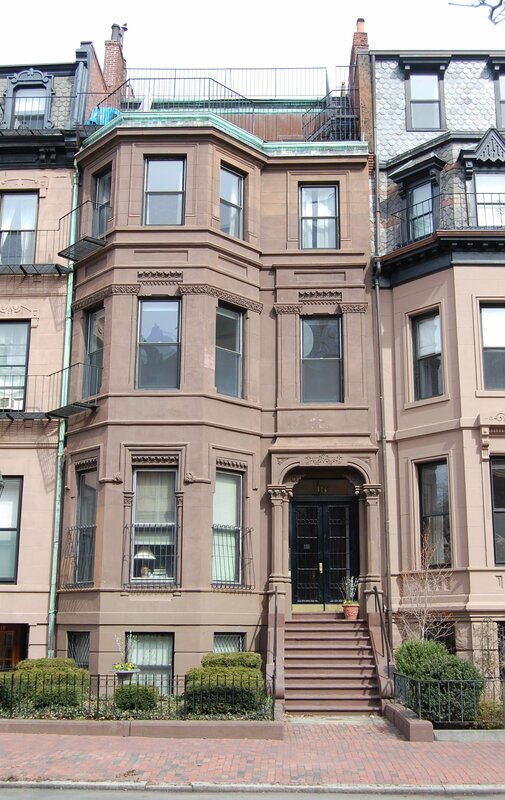 On November 1, 1872, James Standish purchased a six inch strip from Charles Kirby under the party wall with 115 Marlborough, and on July 7, 1873, he sold a six inch strip to James W. Tobey, also a builder, under the party wall with 119 Marlborough, which James Tobey was about to build. Click here for an index to the deeds for 117 Marlborough. On November 1, 1873, 117 Marlborough was purchased from James Standish by Professor William Barton Rogers and his wife, Emma (Savage) Rogers. They previously had lived at the Hotel Berkeley (southeast corner of Berkeley and Boylston). They were joined at 117 Marlborough by Elizabeth Stillman (Lincoln) Rogers, Emma Rogers’s half-sister and the widow of William Rogers’s brother, noted geologist Henry Darwin Rogers. She also had previously lived at the Hotel Berkeley. By 1876, she had moved to 17 West Cedar. William Rogers died in May of 1882 while delivering the commencement address at the MIT graduation ceremonies. Emma Rogers continued to live at 117 Marlborough. From 1909, Emma Rogers’s grand-niece, Miss Mary Otis Porter, lived with her. Mary Otis Porter was the daughter of Alexander Sylvanus Porter and Mary Otis (Cushing) Porter; Mary Otis (Cushing) Porter was the daughter of Luther Stearns Cushing and Mary Otis Lincoln. Mary Otis Lincoln was the half-sister of Emma Rogers (Emma Rogers’s mother, Elizabeth Otis Stillman, was married first to James Otis Lincoln and then to James Savage, the noted genealogist). Emma Rogers died in May of 1911. In her will, she left 117 Marlborough to MIT. Mary Otis Porter traveled abroad in 1912 with her half-sister, Frances Robertson Porter, the daughter of Alexander S. Porter and Frances Wentworth Cushing (Mary Otis Porter’s mother, Mary Otis (Cushing) Porter, died in November of 1877 and Alexander Porter married her sister, Frances Wentworth Cushing, who was Frances Wentworth Porter’s mother). 117 Marlborough was not listed in the 1912 and 1913 Blue Books. On December 10, 1912, 117 Marlborough was purchased from MIT by Miss Elizabeth Hodges Clark. She previously had lived in Cambridge. Her nieces — Elizabeth Lambert Clark, Katherine Farwell Clark, and Anna Newhall Clark – lived with her. They were daughters of her brother, Thomas Welcome Clark, and his wife, Anna Russell (Newhall) Clark. On February 7, 1913, Elizabeth Clark transferred 117 Marlborough o her brother, Charles Story Clark, and Hollis R. Bailey, an attorney, as trustees for her benefit. By 1917, Anna Newhall Clark had moved (she later became an Episcopal nun, Sister Deborah Margaret). 117 Marlborough continued to be the home of Elizabeth Hodges Clark and her other two nieces, Elizabeth and Katherine. They also maintained a home in Jamestown, Rhode Island. Elizabeth Hodges Clark died in July of 1932. 117 Marlborough was inherited by her nephew and niece, Joseph Farwell Clark and Arabella Burns Clark, the children of her brother (and trustee) Charles Story Clark and his wife, Frances Burns. On August 24, 1932, Elizabeth Clark’s trust transferred the property to them. Katherine and Elizabeth L. Clark continued to live at 117 Marlborough during the 1932-1933 winter season, but moved thereafter to 135 Mt. Vernon. By the 1933-1934 winter season, 117 Marlborough was the home of Mrs. Eva Elizabeth (Locke) Stanton, the former wife of Lyle F. Stanton, who operated it as a lodging house. She previously had lived (and operated a lodging house) at 200 Commonwealth. 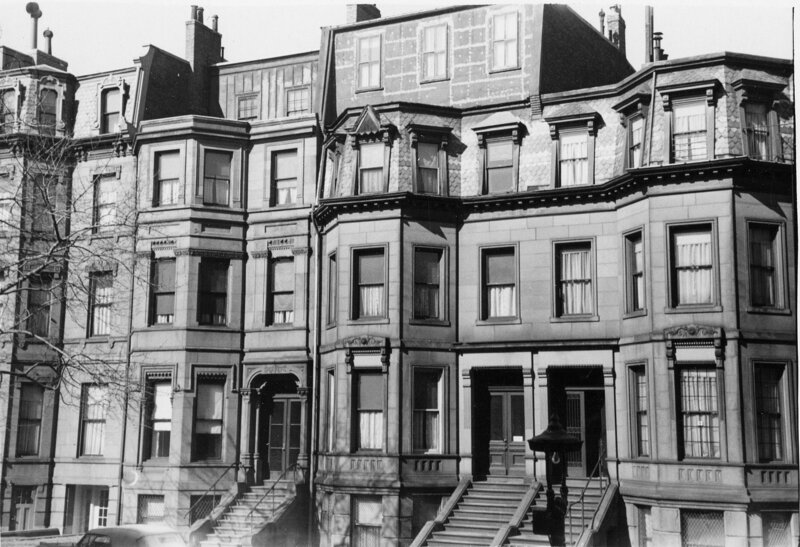 By 1935, she had moved to an apartment at 411 Marlborough. By 1935, 117 Marlborough was the home of Mrs. Belle (Lennox) Beers Harkness, the former wife of Ralph Edmund Beers and of Villeroy Reed Harkness. Her sons, William Daniel Beers, a restaurant operator, and Ralph E. Beers, a student, lived with her. They previously had lived at 229 Newbury, where she had operated the Nancy Belle Frock Shop. They had moved by 1936. 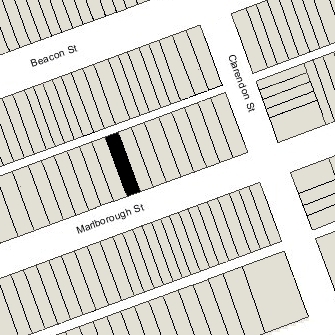 117 Marlborough was not listed in the 1935-1937 Blue Books, and was shown as vacant in the 1936 City Directory. By 1937, 117 Marlborough was the home of real estate dealer Albion Francis (Frank) Packard and his wife, Beatrice Iva (Varney) Laverty Packard, who operated it as a lodging house. In December of 1937, Joseph Clark applied for (and subsequently received) permission to convert the property into a lodging house, legalizing its current use. By 1939, 117 Marlborough was the home of Leonard Crocker and his wife, Mabel Ottama (Packard) Crocker, who operated it a lodging house. They previously had lived in Somerville, where he had been a druggist. Leonard Crocker died in August of 1939. Mabel Crocker continued to live at 117 Marlborough until about 1946, when she moved to 182 Bay State Road. On April 9, 1946, 117 Marlborough was purchased from Joseph Farwell Clark and Arabella Burns (Clark) Cleveland (who had married in June of 1936 to Arthur Horton Cleveland) by Hildur M. (Nordlander) Ekdahl, the widow of Dr. Harold G. Ekdahl, who had been a dentist in Worcester. She continued to operate it as a lodging house. She was a former psychiatric social worker and previously had lived in Danvers, where she had worked at the State Hospital. 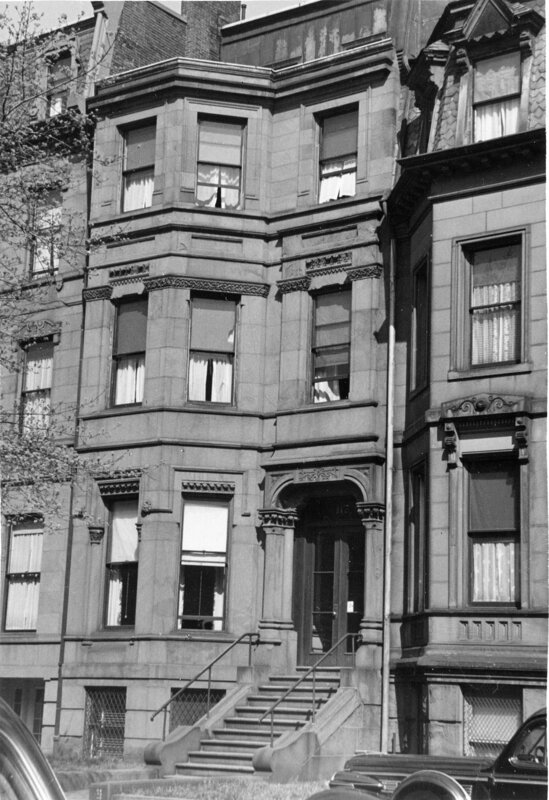 She continued to live at 117 Marlborough until her death in September of 1979. 117 Marlborough was inherited by Hildur Ekdahl’s children: Miriam C. Ekdahl, Richard W. Ekdahl, and Eleanor Janet (Ekdahl) Mitchell Flagg. In October of 1983, they applied for (and subsequently received) permission to convert the property into three apartments. On December 15, 1983, Miriam Ekdahl and Richard Ekdahl, as partners in Rogers House Company, purchased Janet Flagg’s interest in the property. On July 9, 1984, they converted 117 Marlborough into three condominium units, the Rogers House Condominium.